I am so excited to be bringing you this post from a dear friend and fellow blogger, Julie Kieras. This amazing wife and mom of two boys writes about family life and natural living. 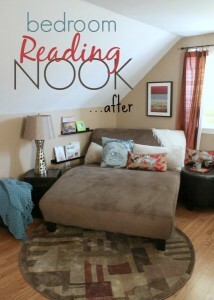 She recently did a redesign of a sitting area within her master bedroom. I know you will get some great tips and ideas for creating intentional spaces for you and your family. 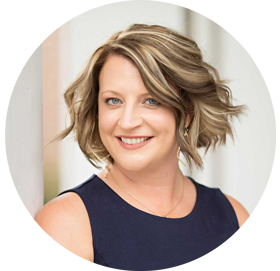 Please join me in welcoming Julie to Designs on the Move. The arrival of children in our home began a journey of trying to find places to stash baby gear, toys, clothes, and create safe and welcoming spaces for our babies. A unique feature of our Cape-style house is that the upstairs bedrooms are quite large. This presents a challenge…our bedroom is, well, our bedroom! It’s not like we’re going to be entertaining up there! I really hated to waste the space, but couldn’t see what to do with this 7×12 foot space under the eave. 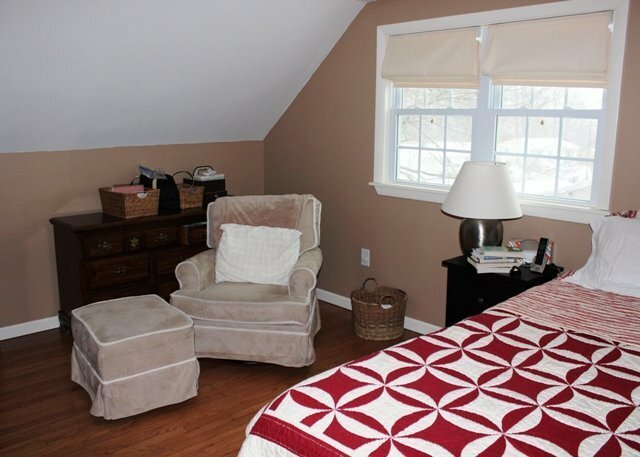 For a long while this whole side of our bedroom languished as a space for extra furniture or overflowing laundry baskets. Finally, I knew I had to do something to inspire this space. My first step: determining a purpose for the room. I decided we needed a family spot. A place for everyone to gather. One thing we love to do together is hang out and read books. 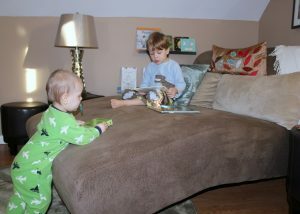 At the time we just sat on the floor or tried to squeeze both boys into the rocking chair with us. 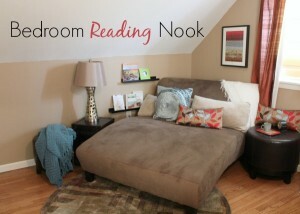 So I hit upon the idea of a reading nook. Next step: choosing my pieces. When I spotted the double chaise lounge at Raymour & Flanigan, I was struck with both the interest value and bold presence of the piece! A departure from the typical love seat or armchair. And we certainly had the space for it! Finally: accessories! Pieces with dual purpose, like a storage trunk, picture shelves (for books!) 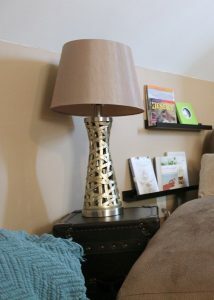 and nesting ottomans (the kids can have extra perches, or I can nest them to open up space) rounded out the space. I added the circular rug to soften the square corners of the other pieces. 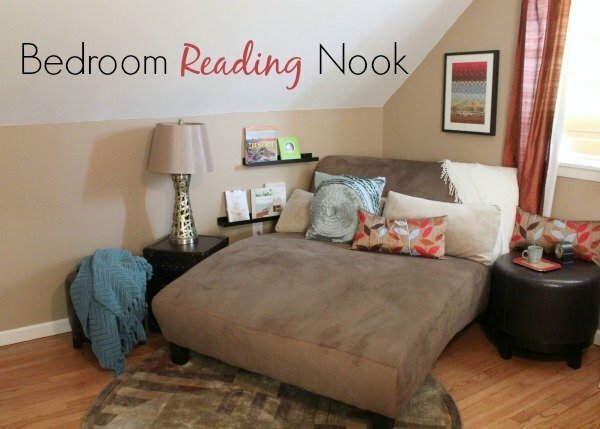 Instead of squarely defining the “sitting area” and the “sleeping area” of the room, the two sides seem a bit more blended. Our family can all fit on the chaise, and our once-cluttered side of the bedroom has a completely new and inviting purpose. Oh, added bonus! When the boys had colds this winter, we sat with them on the chaise (which helped their congestion) and they dozed off comfortably. Recreating a space with intention often pays off with added benefits! Function and beauty! (Although I still have to fight the urge to set a laundry basket on the lounge!). Julie Kieras, mom of two, is always looking for ways to keep life simple and natural for her family. She loves to read, bake, get outdoors, and blog about it all on her site Happy Strong Home!